Day trip to a N.E goldfield. Re: Day trip to a N.E goldfield. Five of us turned up for the day, which started off with a very interesting and informative historical tour of the goldfield conducted by the lease holder. Many thanks to Ron for giving up his valuable time to make this a special day for us. Afterwards Phil, Mark and I dispersed in different directions to detect amongst the old alluvial workings, while Rohan and David elected to pan some virgin alluvial wash that we found in the side of the gully. The detectorists found an assortment of well rusted relics, bullets etc.but gold remained elusive until Phil found two nice little nuggets late in the afternoon. Surprisingly they were located about a foot down in heavy clay. They weighed in at about 1.0 and 1.5 gms an awesome result for his efforts. The only flaw in an otherwise perfect day out was Phil getting a flat tyre on his car. I have some photos of Phil's finds but will have to email to him to post as I don't yet have the ability to upload them. It was an awesome day. And, my wife got a set of gold earrings! (mega brownie points) Great weather and great company. Ron Gregory gave us some fantastic history on the Back Creek area during the morning and showed us his exemplary efforts to not only mine for a profit and some of the factors involved. He also to actively protects some of the historical aspects of this extensive gold field. He is a living legend in Tasmanian prospecting with many active claims and leases across the state. People like him inspire me. And, i am very thankful for the opportunity and to Fox for organising it. Thank you both. The field is amazing and extensive and home to some of our only early puddling dams and gave me the chance to see one first hand was amazing! We also saw some of the first Chinese workings in the state and a description of the activity or as they would have worked the claims and is remarkable the effort and ingenuity and perseverance of our early miners. My find was right at the end of the day about 6 feet away from the road! Right behind us! typical.. i got a lot of iffy ground covered early to delineate the workings to the north and up into the headwaters of the lead we where on. So was a productive day all up. The machines response to the target was strong and clear. Almost overload for a small nugget a foot down is excellent. x terra 705 6 inch coil at noise cancel +2 for higher kHz. Display 12 in Coin and relic. It sounded like gold if that helps. Big strong positive signal. The thing i found most interesting as a potential indicator for future outings is the dirty colour and porous nature of the quartz the gold adheres to compared to the majority of the quartz to be found on the surface. and it look more like the quartz grew on the gold than the gold growing on the quartz as a secondary event. The specimen is much worn with a hint of orthorhombic structure left. Perhaps quartz emplacement was triggered by the later acid volcanic events and using existing faults to travel? These gold deposits where apparently set off during the devonian granite emplacements 360 million years ago as was much of the gold with the later basalt flow filling the stream system and holding back the alluvial field. The leads however resembles tabberabberan orogeny landforms in the dip direction and upheaval during that extensive period of northern Tasmanian mountain building events, so was perhaps formed much earlier. Sorry to have missed what sounded like a very interesting and informative outing I was away for a few days camping and didn't know it was on until it was too late. Any chance of a similar outing some time down the track? G'day John and everyone, sorry about the short notice for the trip, but it's a bit hard at this time of year to get a window of good weather and when the opportunity presented itself, I had to act quickly to organize it. I will definitely organize another one when weather and time permits - possibly a weekend up there would give us more time to explore the field a bit better. 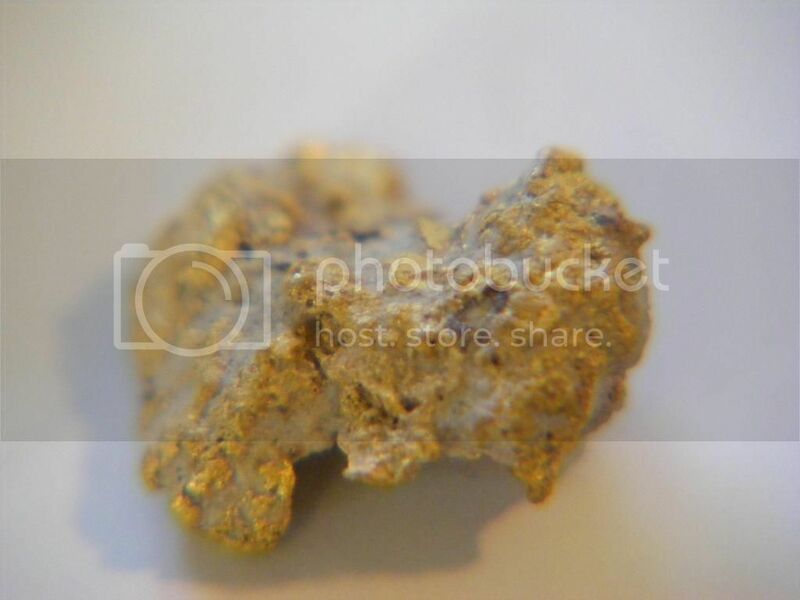 #1 - A 0.85gm nugget encased in clay, found 13/04/14 with Garrett ATX. All found with ATX except for a 1.6gm sunbaker top left. Excellent work Phill, very jealous especially having the tour from Ron. there are some very interesting clips on you tube comparing the ATX against the 5k. As soon as the water dries up here im going to be the proud owner of the ATX. I've still got your gold do you want me to send it down to top up for the wifes ear rings. Look forward to meeting you and everyone else! Pretty sure that after seeing the results of last weekend the response to a similar trip should be great. HI all. i have used 3-4 or even 5? different Minelab gpx5000's. And personally i think they are amazing machines. i Still do. (at finding my shovel, HT wires, hematite, magnetite and other big magnetic and EM objects) They are the most sensitive to metal detector, i have ever used. But,,, on gold, ever or not or never. im, still waiting,. i have never, ever,, personally seen a single person, pull a single speck of gold out of the ground in Tasmania with a GPX5000! Coral and Ren are the only people i know off, in Tassie that has found a gold nugget with a GPX, down here. its the iron rich background? perhaps. Its definatly not lack of swing time. But, even i pulled up a Negative reading on a few grams of gold as fines with the x terra. As you would expect in a fat crevice. So minelab fault? i started digging everything neg as well now, so i cant miss., silly machine. kane and I found some gold fines last summer and they are indicative of Tasmanian gold. I still love minelab machines, even though it is no longer Australian owned. The product has fallen imo for it's product price and i guess if minelab if they want to be second best. Thats their corporate choice. I couldn't make it this time. I'd love to come along another time though. I've been to the area in the past (no gold yet), and having permission would be awesome, I've always found it hard to tell where the leases start in order to stay out, even with my GPS. I just don't know how I missed this opportunity be be part of the event that you arranged. Amongst the dialogue you made mention of another trip, is there anything in the pipeline? Reason for asking is that I am heading interstate shortly for 3 months.